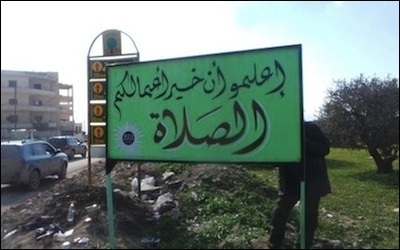 One of more than 50 Jabhat al-Nusra billboards and murals translated by Jawad al-Tamimi (see below). This one reads, "Know that the best of your deeds is prayer." Middle East Forum Shillman/Ginsburg Fellow Aymenn Jawad al-Tamimi is one of the world's leading experts on the Islamic State (IS) group terrorizing Iraq and Syria, also known as ISIS. The overwhelming majority of his writings and translations are too detailed or esoteric for distribution to a general audience, so instead MEF compiles periodic updates providing links and summaries for those who wish to follow the groundbreaking work of this prolific researcher. For more general interest writings by Jawad al-Tamimi, click here. Examines the Sunni jihadist group Jamaat Ansar al-Islam, which was based primarily in Iraq until its disintegration in the wake of last year's IS advance across the north of the country, leaving an orphaned chapter in Syria that remains opposed to IS, despite suffering many defections. Includes an annotated translation of a series of tweets, entitled "Recollections with the Traitors," from Abu Omar al-Falastini, a prominent IS defector now affiliated with Jabhat al-Nusra. A collection of more than four dozen photos of billboards and murals put up by IS rival Jabhat al-Nusra, mostly in Syria's Idlib province, with English translations of Arabic text for each. For IS billboards and murals, see here and here. Examines Gaza-Sinai jihadist group Jamaʿat Ansar Bayt al-Maqdis (JABM) and other pro-IS forces in Sinai. Official IS media releases "suggest that the IS in Sinai is a military force, but do not indicate that it controls substantial contiguous territory or meaningful towns in which the IS can claim it administers state-like governance," notes Jawad al-Tamimi, and "there is as yet no indication of IS state or proto-state bodies in the Sinai Province." He also finds "a notable lack of unity" among pro-IS groups in the Sinai. With "increasing pressure in Iraq and Syria limiting the organization's ability to expand and provide support to affiliates abroad," it's unlikely that IS in Sinai will establish the kind of consolidated territorial presence achieved by IS in eastern Libya. Review of ISIS: The State of Terror, by JM Berger and Jessica Stern. Jawad al-Tamimi praises the book's treatment of IS social media strategies as an "original contribution" and seconds its policy recommendations for stronger online media disruption by the U.S., but cautions that Berger and Stern get many details wrong (due to their reliance on secondary sources) and don't shed much light on what goes on inside this "state of terror." Brief translation and analysis of a statement from the Palestinian Hamas movement condemning the March 18 IS terror in Tunis that left 20 dead as a "a crime against human values." A musical chant (nasheed), produced by IS's Ajnad Media Foundation, designed to rally support for IS in Yemen, where the Sunni jihadist scene has long been dominated by Al-Qaeda in the Arabian Peninsula (AQAP). Like other IS propaganda in Yemen (see here and here), this nasheed is focused on the evils of Shi'a Houthi rebels and Iran. Aymenn Jawad Al-Tamimi is a Shillman-Ginsburg Fellow at the Middle East Forum.